Saving the endangered live oak in Fayetteville, Texas. Cleve's concern for the tree is reminiscent of Comanche County's Fleming Oak. Who knows? Perhaps in time there will be a historical marker in Fayetteville as there is in Comanche, honoring someone who took the time to call much-needed attention to a town's oldest resident. "There isn't anything that you can't do something about." Cleve Friddell is a former Houstonian (Milby High Class of '40, Bachelor of Applied Sciences from University of Houston) who recently settled in the bucolic wilderness of Fayette County. To the village of Fayetteville to be exact. A town where lawn ornaments outnumber citizens and nothing's wild but the flowers. 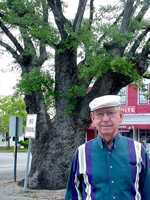 During his twice-daily constitutional walk through town, Cleve couldn't help but notice the declining condition of the huge Live Oak tree that grows near the precinct courthouse on the town square - a tree surrounded by an ocean of asphalt. The tree, of course, predates the courthouse and come to think of it - it even predates asphalt - at least the type that's put down as pavement. 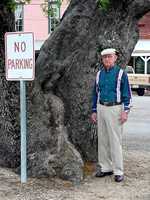 The tree was probably substantial enough to take into consideration when the town was platted back in the 1840s. The Tree-in-the-Street Sorority and "Old Ironsides"
Fayetteville is a member in good standing of the Tree-in-the-Street Sorority - a group of small towns that spreads from Columbus south to Goliad and west to Bigfoot and Uvalde. As a matter of fact, this lone tree is Fayetteville's membership card. Without it, membership would be withdrawn. In the aforementioned towns and others, settlers recognized the majesty of the Live Oak. They also noticed its stubborn resistance to ax blades and wedges and moved on to cut trees that weren't so tough. The dense fiber and springy heartwood of the species made history when Florida Live Oak timber was used in the construction of the U.S.S. Constitution. British cannonballs in the War of 1812 literally bounced off the sides of the ship - earning it the name of "Old Ironsides." Cleve contacted a professional arborist from Austin who came and gave his professional opinion of the tree and its condition. It was officially declared old. Make that old with a capital O. A tree's age can only be accurately determined by taking a core sample of the growth rings - but the estimate of this specimen one runs right through decades and into centuries. The appraisal calls for deadwood removal, feeding, increased soil activation and monitoring. It is entirely possible that with this care, the life of the tree can be prolonged for many more years. 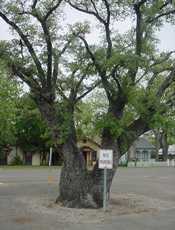 Texas may have another arboreal success story - like Austin's Treaty Oak or La Grange's Muster Oak. The estimate for treatment and maintainence is $3,000 for the initial phase of work and $1,500 each for the following two years. Local papers took up the story and Cleve's cause was supported en mass by Girl Scout Troop 1327 who set out jars in local stores for contributions. You don't have to drive to Fayetteville to put a donation in the jars - a fund has been set up at the Fayetteville Bank.